Are you on the look out for events and people to meet in your local area? If you are already a SoMe expert, you an skip this article. If not, find our short guide on how modern technology quickly can become your “best” event planner. As an expat looking for a feeling of community, one of the easiest ways to meet new people is by attending local events curated to an interest you may share with other people. With the benefit of technology and the facility of social media, we no longer have to rely on the old fashioned way of finding events on a poster taped to a telephone pole. One of the most direct ways to discover these social gatherings is through Facebook’s events feature. On the right hand side tab of the Facebook homepage, under the “Explore” segment, you can click on the “Events” page. Here you can see events that are close to home or coming up in the near future. 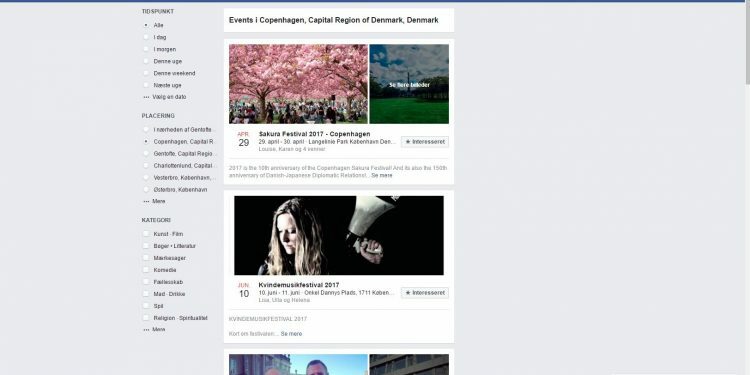 You also can see events that your Facebook friends are interested in attending and even discover some events that are recommended to you. It’s easy to get carried away scrolling through all the events going on in the city, but it just goes to show that Copenhagen is a city with fun, engaging people and plenty of activities to do! You can narrow your search by selecting the kind of events that meet your interest by selecting the “explore events” icon, which opens with extra search features to select by. Wherever you are, it will show you events around that area. You can choose if you want today’s events, tomorrows or another date altogether. Even if many events are described with Danish text, they are easy to grasp with a little bit of Danish, or use a text translating function to get the English version.